This deceptively simple narrative charts the rise and rise of a thirty year old woman from somewhere she didn’t know she was, to somewhere she didn’t know she needed to be. I’m trying not to give the plot away but the book primarily concerns itself with skewering our 21st century culture of not giving a damn. The Eleanor in question is a thirty year old office worker who appears out of step with the modern world to a startling degree. She doesn’t even own a mobile phone at the beginning (although, phew! she does by the end). The book sections are divided into ‘Good Days’ and ‘Bad Days’ and ‘Better Days’. It is slowly revealed throughout the course of the narrative just how bad the bad days were for our poor heroine and why she behaves somewhat oddly. There is a distressing backstory which slowly reveals itself, but this is not at all a distressing or depressing book. Upbeat rather with its message that even if you are falling apart from loneliness you can still be fixed. ‘…the lonelier a person gets, the less adept they become at navigating social currents. Surprisingly this is a page turner – with a twist at the end which I half saw coming. I finished it over two days of rain and snow in a half–empty hotel near Caernarvon, waiting to attend the harp festival. This is a book to curl up with and if you are feeling a tiny bit sorry for yourself it will magic you better. 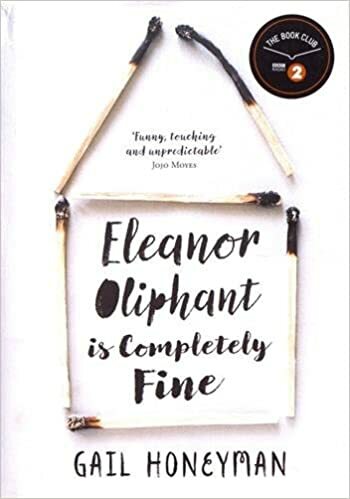 Indeed you cannot help but compare yourself with Eleanor and feel better – unless your backstory is even worse than hers. In which case dear reader you are much to be pitied.